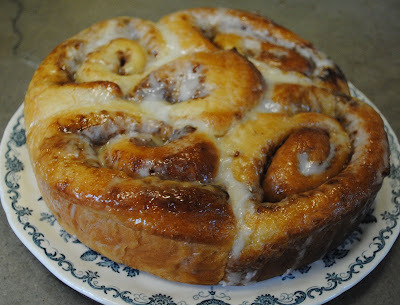 Amish Cinnamon Rolls -- Not an Amish recipe made by my hands but an Amish recipe made by their hands! We have a small Amish settlement north of our town on the prairie and they are regular visitors to the Tuesday and Saturday Farmer's Market -- mostly coming in their horse driven buggies -- with produce and baked goods to sell. And for a treat, we buy a pan of their cinnamon rolls on Saturday morning. To be saved and then reheated (but not for long) so that the icing is melty and the rolls warm. It's a perfect Sunday breakfast. To linger over with another cup of French press coffee. It's great to have someone bake "from scratch" cinnamon rolls when you're not inclined to. And it's not who makes them but how well they're made. The Amish cinnamon rolls are superb!!!! We used to have a fairly large Amish community come to Homestead in South Florida and we used to drive about an hour to get these. They are the best...sorely miss them! Oh my goodness! It makes my toast and coffee this morning sound very dull, indeed! I lived in Pennsylvania right in the midst of Amish country. Every Saturday my mom would get these for us. It was a nice family breakfast treat. Amish Sticky Buns, they are a good thing. My mouth's watering, that looks delicious! Those rolls are beautiful! I think I can taste them...and then with the French press coffee...heavenly! Warm cinnamon rolls are the perfect was to start a Sunday. Benedictine nuns used to sell cinnamon rolls in a booth at my farmers' market but they haven't been there the last few years. I have several recipes for cinnamon rolls but haven't made any. I'd like a recipe that can be done the day before with the baking done the next morning. Or, better yet, some delicious looking Amish ones like yours. We are bemoaning the fact that tomatoes are becoming illusive around here too! Oh I am so hungry for these. My Mother always made homemade cinnamon rolls...so good right from the oven!